Anna and Nick live in Manhattan and are planning a super fun wedding at Reading Terminal Market (in Philly) this fall! After falling in love at college, they moved to the Big Apple and enjoy self-guided walking tours around NYC, cooking together, and traveling around the globe (including riding elephants and visiting beaches in Thailand, where some of Anna’s family lives!). Nick proposed on Roosevelt Island, a small island next to Manhattan. They were walking around Four Freedoms Park, “a symmetrical wonder away from the hustle and bustle of the city,” and he asked Anna to marry him! She was completely surprised, and they’re overjoyed about the next chapter in their lives. 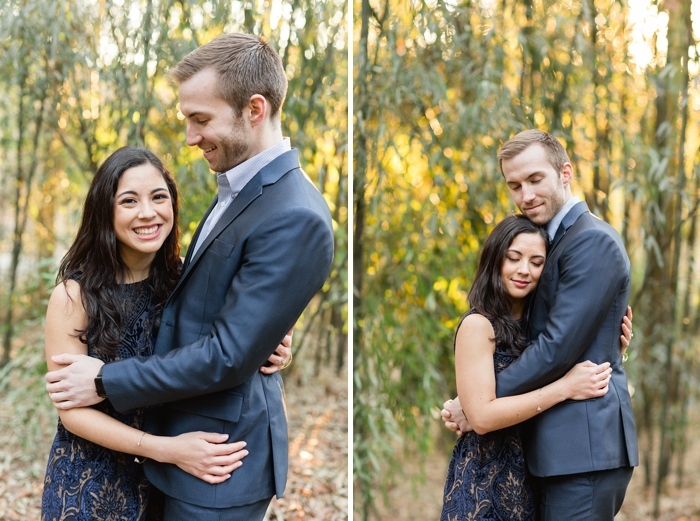 A bamboo forest was a serene setting for their engagement session, and I’m sure these will bring a smile to your face. Aren’t they the cutest!? I’m still swooning over their outfit choices!